Online casinos can take several forms of payment, but not all of them allow you to withdraw. You will need to know how you get your money in and how to get your money out, which can sometimes mean using 2 different financial instruments. Just so you are not confused, our experts have listed some of the different payment options that are available to you. They have covered which options are best for quick deposits and withdrawals as well as other payment and withdrawal methods that are used for those that do not have a bank account that can be used for funding online casino play. Online casinos take pride in their security systems. Not only that, licensing authorities are on top of all online casinos to make sure that all financial transactions are safe and secure. High tech firewalls, and internal policies to make sure player account information is protected guarantees online casino players that when it comes to handling monetary transactions, they are in safe hands. For the most secure online casinos, check to see if the online casino is licensed by the UK Gambling Commission (UKGC). All online casinos holding a license with the UKGC are bound by British laws regularly test the casino is adhering to the UK’s Data Protection Act that stipulates all online entities handling financial transaction online must implement 10 Steps to Cyber Security. This is a financial grade system that has been applied, tried and tested in both the US and British stock and money markets that implement unbreakable online security systems. Now you would think that we would begin with credit cards and debit cards. However, in our opinion, the very best and quickest ways to get your cash in and out of a casino are via one of the many e-wallets made available to you as a financial tool by the online casinos. One of the most widely accepted e-Wallets by online casinos is Neteller. Although in terms of customers and transactions online it comes behind PayPal, when it comes to online casinos, more casinos accept withdrawals and deposits from Neteller compared to any other e-Wallet – that includes PayPal. phenomenal security and super quick transactions make Neteller the king of casino e-Wallets. Yet another e-Wallet that rivals both PayPal and Neteller. Although Neteller pips Skrill in the online casino industry, more online casinos make Skrill available compared to PayPal. It is available in over 200 countries and boasts super-fast as well as secure transactions. Formerly known as Moneybookers, Skrill is a great choice of e-Wallets. Founded in 1999 just before the turn of the millennium, EcoCard a.k.a. EcoPayz is accepted at near enough all online casinos nowadays. One of the reasons this e-Wallet is very popular is because one of the services offered enables casino players to withdraw from the casino to its financial facility and then transfer funds directly to their pre-paid credit card. This is effectively an e-Wallet, except you can make withdrawals from the online casino back to a PayNearMe account. The reason online casinos accept this payment method is because it allows casino players to top up their casino balances using cash. Simply visit a store that accepts PayNearMe with your casino account credentials for PayNearMe payments, and your casino account is credited. Although this not strictly an eWallet, it may as well be. It is a new innovative payment solution where UK customers can fund their online casino account via their phone bill. All that you would need to do is select PaybyPhone and your phone number to let the casino know which phone provider to request the fund from. You would then pay as you would normally with your mobile phone billing cycle. There is no doubt that PayPal is an extremely safe online payment method. Unfortunately you can only use Paypal for gambling in a few countries, and only at some online casinos, but the bigger ones (See Below list) will have the options to deposit and withdraw via PayPal. Most transactions with PayPal are instant making this a solid option if you have a PayPal account or if you were contemplating opening one. PayPal is not accepted in Canada, so we recommend using Visa, Mastercard, Neteller, and Skrill instead there. If you do not have an e-Wallet or prefer not to wait to set one up, then you have several options to deposit and withdraw to your chosen online casino via card payments. Card payments, depending on the one you choose, are quick and reliable ways to deposit and withdraw from online casinos. Credit Cards are one of the most popular ways for online casino players to deposit and withdraw to and from their online casino accounts. VISA, MasterCard, Diners Club, and Discover to name but a few. Pretty much every online casino accepts credit cards as a payment and withdrawal method once you have passed their card owner verification steps and been approved. Debit Cards are also a very popular deposit and withdrawal method. Nearly all the online casinos accept debit cards; especially UK online casinos. As with credit cards, you need to be approved via certain security checks to establish that you, in fact, the card owner. Maestro, VISA, VISA Electron, Switch, Union Pay and Laser are popular debit card systems providing lightning-quick deposit and withdrawals. PaySafe is one of the most popular UK and European pre-paid credit card options for online casino players. Near enough every online casino accepts PaySafe cards as do EcoCard e-Wallets for withdrawals to PaySafe cards. It is a fast and reliable deposit method that can be topped up with cash at local high street retailers. However, withdrawals are not accepted, so you would need an EcoCard e-Wallet too. Entropay is similar to PaySafe Card except it is a virtual prepaid VISA or Mastercard depending on which you choose. The idea of this payment method is to use a different virtual card number every time you make a transaction. Some people prefer this way of depositing and making online payments. Entropay cards can be funded using a number of different credit or debit card options. Surprisingly, AMEX cards are not the most widely accepted amongst online casinos – possibly because of its high transaction costs. Increasingly online casinos have been making it easy for AMEX card holders, which makes sense as members of AMEX are mostly affluent individuals. If you find an online casino tat accepts AMEX, then this is also a fast and reliable way to get your money in and out. After e-Wallets and Credit Cards, Debit Cards, as well as Prepaid Cards, the next most popular way to deposit and withdraw from an online casino, is via bank transfers. There are several options available depending on the online casino you play at. Nearly all online casinos accept wire Transfers nowadays. It used to be a reserved payment system for high rollers, but now most online casino players can transfer into and out of there online casino accounts via wire transfers. Often this option comes with a small fee and the minimum deposit/withdrawal is generally higher compared to other financial methods. Mostly eCheck is used by Canadian players. However, increasingly it is becoming a popular payment method for both UK and European players. It cannot be used as a withdrawal method. Nonetheless, it is an extremely simple way to make a deposit to any of the top online casinos that accept eCheck as an online payment method. Instadebit is commonly found as a payment method on many online casinos. However, it is mainly for Canadian players, and as such not many UK or European players will use this as a way to fund their online casino account. 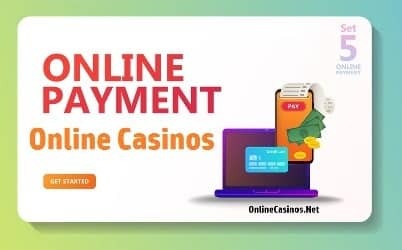 If you see that your online casino displays this as an online payment method, then the casino is also available to Canadian players where licensing is as strict as the UKGC. Mostly used by casino players in the Netherlands to top up their online casino balance. For Dutch players, it is one of the most popular and easiest ways to deposit. Once upon some time cheques were a popular payment method. That was when e-Wallets and online payment systems either did not exist, were not trusted as of yet, or few and far between. Online casinos still accept cheques for both deposits as well as withdrawals. However, the obvious downside is that this is the slowest way to transact financially with your online casino. Citadel is connected to over 200 banks and as such does seem to be increasing in popularity. More online casinos are displaying this as an accepted deposit and withdrawal method (or one or the other). It was set up in 2,000 helping those that like to make use of internet banking as a payment method. Currently, you can find Instant Banking by Citadel available in over 33 countries. You may from time to time see other payment options offered by online casinos that you have never heard of. This is mainly because they are not available in your country. The main purpose of some these deposit and withdrawal methods is to target online casino players in certain countries where financial facilities are either scarce or very strict. Trustly is becoming available all over the world. It is a technology company that has dipped into the online payments market simply because they are always looking for innovative solutions to help people have a better online experience. You can use Turstly with your own online banking environment in order to make payments. This payment method is commonly seen at online casinos. It is in Germany as a payment gateway between the service provider and the account holder’s bank using secure online banking. Also known as InstaDebit, iDebit, is a system that is available to and very popular with Canadian online casino players. iDebit is a tool that facilitates the transfer of funds from one account to another; a middleman. The reason iDebit became so popular is unlike eWallets, there are no fees applied to deposits or withdrawals, and as such online casinos encourage iDebit transactions. This is a very established online casino payment tool that is predominantly for Russian players. Though, today Qiwi is spreading its wings and is available in 20 countries. As far as payment options go, it is a newcomer to the market only established in 2009 and since that time has built up a loyal following of over 15 million. Like Qiwi above, GiroPay is another newcomer established in 2006 in Germany’s Postbank. At the moment the service is only available to German and Austrian residents. Now just to build a picture of how popular it is in these two countries – over 17 million people rely on GiroPay as their preferred online payment system. Very few online casinos accept Bitcoin. If you are planning to use BitCoins to fund your online casino play, then you would need to find a Bitcoin casino. It is slowly increasing in popularity as blockchain becomes increasingly popular. As time goes on, we expect to see more cryptocurrency casinos. It seems inevitable that cryptocurrencies are soon going to be accepted as an online payment method across the board. As we were researching poplar cryptocurrencies, Ethereum came to our attention. It is one of the kids on the block when it comes to blockchain currencies, but it appears that some online casinos are also accepting it as a deposit and withdrawal method. It just goes to show that cryptocurrencies are likely to become an established financial option on all casinos in the near future. Most online casinos want to make it easy for you to deposit. That is the whole point of the casino because they want you to play real money. Plus, it is fair game because the casino gives you the opportunity to win; while, giving the casino the chance to make a profit. The best way to find out the deposit methods available to you at a glance is to look at the casino’s footer. There are usually symbols that depict the banking options available to you. There will always be a section that gives you a full list of deposit and withdrawal; it is just a case of finding it. Of course, it helps knowing where to look too. Every casino is different. If you are a member, then it is easy to find out this information. Just sign up for the online casino and visit the cashier. Although, most people would prefer to know this information before they sign up. For instance, at Vegas Paradise it is easy to find out withdrawal and deposit methods available because the casino has dedicated sections on these subjects. Look at the screenshot and you will see above the list of financial branded images, there is a list and right after “FAQ” it shows “Deposits” | “Withdrawals”. Pending time is set to some withdrawal methods so the online casino can check the transaction. Also, they do this to give you the chance to dispute or reverse a withdrawal if needs be. Nearly all transactions are free, but if there is a charge, then you will also find this information associated with the payment methods. Some of the financial options that we have mentioned do not accept withdrawals. Now for some people, I know this does not matter because they rarely want to withdraw from their casino balance. Rather when they win, they prefer to up the stakes, and if they lose, they reduce their stakes. On the other hand, there are those that set a monthly budget, or a target number and prefer to withdraw. This latter statement being the most common amongst online casino players. If you plan to make withdrawals from your casino account, then make sure you understand the options available to you. If your hands are tied and you can only gain access to a deposit method, then don’t worry. You always have the option to withdraw by cheque. For most online casino players, e-Wallets, Credit Cards, and/or Debit Cards are the best options for them because deposits and withdrawals in most established online casinos are instant. Furthermore, it is much easier to use one financial tool that both functions to make deposits as well as to make withdrawals. Some like to separate deposits and withdrawals. Their deposit method has their monthly budget, and the withdrawal method is just a bonus way to spend money if by the end of the month the account owner has spare cash to make a withdrawal. Whatever happens, make sure that you research what you think would be best for you. There are limitless options, so rarely anyone finds themselves stuck when it comes to dealing with online casinos financially! Which one of these financial methods is the safest? Seriously, every single deposit and payment method in this list is safe and secure. There is not much differentiation between each payment method in terms of security. They all take player privacy and safe as well as secure transactions seriously because it is their business’s reputation on the line. Your credit card company will have fraud protection teams, digital secure keys come with other financial tools, identity protection, and 128 Bit Secure encrypted transactions all safeguard your transactions. Do you recommend eWallets over Credit Cards? Honestly, it really comes down to personal preference. For me, I play at many different UK online casinos. Although I know they are all safe, I prefer eWallets. All my cards and bank accounts are on my eWallet, so it just makes dealing with all the online casinos easier for me. Others that use e-Wallets do it because they don’t want to share their card details with every casino or online shop they make a purchase from. Do I have to own a credit card? Nope. Read all the payment methods we have listed above. You can pay using your phone bill if you are a UK resident. You can use a debit card or e-wallet too. How can withdraw if my payment method only allows me to deposit? Simple. Most people that have no options available to them to withdraw request the casino to pay them via cheque. Others will open an account with a company that will allow them to withdraw. Does my location restrict my options? Yes, but only sometimes. For instance, PayByPhone is only available to UK residents. On the other hand, UK residents cannot sign up for options such as iDeal. How will my winning be paid? If you use an eWallet, then you are paid in the currency you used to withdraw. On the other hand, if you withdraw to your credit card using US$ and you are in the UK, then exchange rates will be applied and GB£ are paid into your account. What are the fastest deposit and withdrawal methods available?